Complete with the cheesiest Western music you’ll ever hear, the large and cheap portions dished up at The Vegetarian will keep you smiling. All dishes, including juices, cost one US dollar (some drinks are $0.50). The menu includes a selection of soups, sandwiches, noodles, rice dishes, stir fries, salads, and the usual Asian snacks that come to mind when someone says “Asian snacks” (spring rolls, dumplings, etc…). Definitely a worthwhile lunch spot, it’s popular with expats, locals, and tourists alike. 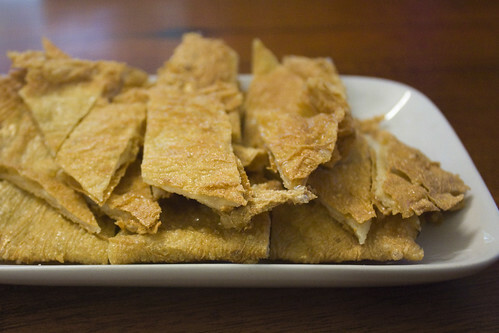 Thick, folder layers of deep fried yuba for the win! Served with a semi-sweet mild vinegar based chili sauce, the soy skins were crispy on the outside and soft on the inside. Quite oily but delicious and simple with a tiny bit of salt, this is one heck of a plate of protein. Arrive with an appetite if you want to order more (which I always do). A lovely, light broth filled with crispy wontons, green leafy veg, mushrooms, and rice noodles, this lightly peppered soup hit the spot on the rainy day I chose to visit The Vegetarian. The dumplings were stuffed with seasoned carrot and onion pepper filling, and had an almost Italian taste. 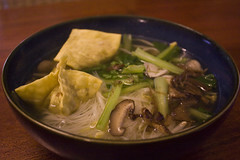 Not the combination I’d have picked for this type of soup, but it worked well! For a dollar a menu item, this place really can’t be beat. If you’re a backpacker on a budget in what’s definitely not Southeast Asia’s cheapest city, hit this place up for a filling and satisfying meal. I totally agreed. The food is so tempting and delicious. Never thought vegetarain can be so nice. They even served Western, Asian, Thai, Indian, Malay & many other food too. I love the food and also the comfort and breezy environment.